Come & join us for an outdoor adventure at Lusty Glaze beach in Newquay on the Cornish coast! 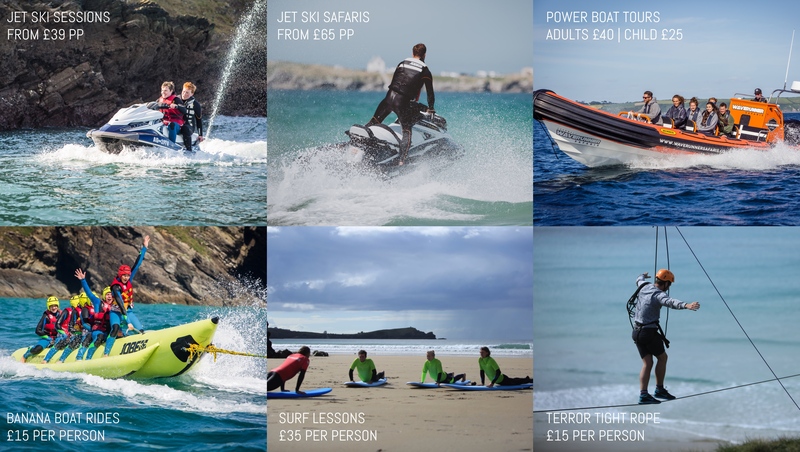 Get a feel for Jet Skiing on one of our Sessions or Safaris riding the latest Yamaha Jet Skis or jump onboard our Power Boat for a tour around the beautiful Cornish coastline. If you want to spend time in the water, why not learn to ride the waves in a Surf Lesson or see who can hang on the longest as you blast across the bay on a Banana Boat Ride. With our Terror Tight Rope Walk, Beach Volleyball, Football, Dodgeball & Tug of War, we have something to suit everyone here at Cornwall Waverunner Safaris. No experience is needed for any of our activities - just give it a go! If you are looking to visit the South Coast of Cornwall, we have another office at Carlyon Bay in St Austell. With calm, clear waters almost every day of the season it is the perfect location to explore the coastline on a Jet Ski Session or Safari. We also offer Banana Boat Rides, Beach Volleyball and Stand Up Paddleboard hire.